Lincoln Cathedral echoed to the deafening call to “Crucify Him” and the pained cries of the sacrificed Christ and his weeping mother rang out. 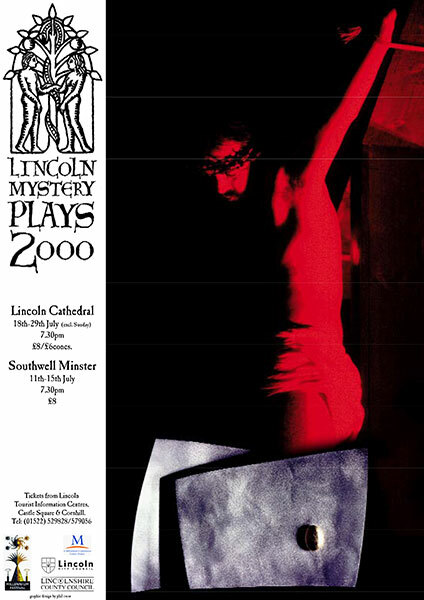 On the opening night of the millennium run of the Lincoln Mystery Plays the audience needed no invitation to reward the first rate acting with a piece of their own performance. As if eagerly awaiting their chance to join in this awesome spectacle, the crowd took centre stage for a moment as the Biblical legend reached it poignant climax. Brilliantly set amid the magnificcence of the Minster’s Nave, the vision of Christ on the Cross was a haunting high spot in a stunning show. Neil Perkins fulfilled the role of Jesus with both humility and majesty, visibly putting his all into the harrowing Passion. Under the exemplary direction of Keith Ramsey, the strength of the scene left the audience spellbound and visibly moved. From Creation through to Crucifixion and on to the day of Judgement, all within three hours, was a theatrical tour de force. But presented with an artful blend of reverence and humour, there was poignancy at every level and freshness to the world’s most chronicled story. Lighter relief was provided by a fantastically camp Tony Fielding-Raby, playing King Herod and the shepherds Colin Brimblecombe, Keith ramsey and Jack Jones– in a dramatic switch from his commanding presence as God. Ali Cormack–also assistant director–was the embodiment of piety and virtue as the Virgin Mary, before Irene North took over the role 33 years down the line, at the foot of the cross. Her anguished portrayal was enough to move the most hardened heart. Ba Wheeler illustrated the adaptability of the whole cast in her switch from demure Angel Gabriel to frantic Mary Magdalene. Meanwhile Ben Poole was a constant throughout, with his perfectly enigmatic depiction of the Devil. True to form he both charmed and shocked, while his seven month daughter Violet Kamal-Poole could only charm on her acting debut. Not exactly the meek and mild baby Jesus one would expect, her cries reaffirmed that this was real drama reflecting real life. She was not the only child in danger of upstaging the more accomplished cast, as children from the Lincoln Stagecoach theatre school also went about their essential roles. This really was a story about life and death, as vivid today as when first portrayed 500 years ago. From Richard Jones’ Adam, through to Karen Crow’s spine-chilling Death, all human life was here. And when coupled with dazzling costumes, heavenly music and an imposing setting, this was one glorious spectacle to behold. Beneath the hilarity, humility, and even the sense of wonder inspired by Lincoln’s Mystery Plays, which opened their millennium production at the city’s cathedral on Tuesday night, runs an irresistable sense of continuity. Sitting inside the walls that have stood for centuries listening to words written when the building was young, it was suddenly easy to imagine the countless thousands of people who had sat among those same stones, wide-eyed with reverence- and perhaps even fear- as the greatest story ever told was brought to life before them. And they would have been fortunate indeed to see as consummate a performance of those wonderful historic texts as that which unfolded at the cathedral this week and where it continues until next Saturday, July 29. For this 2000 production- and with the help of a £30,000 Millennium Commission Grant- no stop has been left unpulled. The costumes are superb, the music wonderful, the sets inspired in their multi-functional simplicity, and such props as are necessary- particularly the world painted on a parachute for Satan’s temptation of Jesus- complementing rather than overwhelming the twin strengths of these performances..the words and the players. Having chosen to stage just 16 of the cycle’s 42 separate plays (and shrinking the unthinkably long down to a mere three-and-a-half-hours) director Keith Ramsay has also succeeded with a sympathetic modernisation of the texts which retains as much of the medieval language as possible but makes it accessible to modern audiences as, clearly, the original words would have been to their contemporaries. But the main reason it all works so well is the acting talent which has been brought to bear, uniting many of the city’s best know amateurs in a cast which would stand up well alongside most professionals. The outstanding contributions made by the likes of Neil Perkins as Jesus; Ben poole as Satan (looking not unlike Brandon Lee in cult horror movie, The Crow); Tony Fielding-Raby as a sublimely miserable and cloyingly alliterative Herod; and Karen Crow as a truly chilling Death, would be hard to overstate. Another factor in its success is the humour which has been played to the maximum, not least the Wallace and Gromit-type sheep in the Adoration of the Shepherds (in which Jack Jones, Keith Ramsay and Colin Brimblecombe become the medieval equivalent of The Three Stooges), Satan’s over-the-top flatulance or Herod sucking his thumb and fiddling with his hair like the human equivalent of Prince John in Walt Disney’s animated Robin Hood. As the action moved towards Christ’s crucifixion, so the crowd moved into the nave of the cathedral where the latter part of the cycle was played out. After the intimacy and immediacy of the cloisters, the poor acoustics of this new venue were something of a let down, but even this could not tarnish the power of the Crucifixion itself. As Jesus died and his head lolled forward, his body and the cross were suffused with red light in the otherwise dark cathedral, creating perhaps the most deeply affecting moment of the evening. The much publicised Millennium Dome costumes were spectacular (if stricktly unnecessary), but did help usher in the traditional finale in which members of the audience are either ‘saved’ or ‘damned’, a prospect which presumably helped keep their medieval spectators on the straight and narrow for a few weeks at least. This is a marvellously pitched, produced and performed re-telling of the Mystery Plays and a tribute to all involved, not least Keith Ramsay who has been the driving force behind these plays for more than two decades and whose swansong this production will be. A hugely enjoyable and strongly recommended evening. Christopher Box, Fay Bolsover, Rebecca Bristow, Katie Brown, Laura Brown, Hannah Bullock, Susie Crossfield, Sophie Flanagan, Natasha Frayne, Hayley Gill-Fletcher, Victoria Hart, Charlotte Kemp, Rebecca Mann, Alexandra Parkin, Thomas Rawlins, Gayle Richardson, Asha Thomas, Hannah Wilkinson, Natalie Wright.